5/6 #onpoli The NDP are now clearly second, 4 points above the Liberals and 4 points below the PCs. While only 46% have heard anything about the NDP, 51% are more favourable and just 12% less favourable. Imagine what happens as attention grows if this momentum continues. In the meantime shouldn’t everyone move their debate to the Ontario election thread? Ok so if asking a whole party to give up to avoid splitting the vote is not trolling it is the height of stupid. Nobody is suggesting it. I'm just saying if I was Kathleen Wynne that is what I would do. That is one of many reasons why she is the premier of the largest province in a G7 country, while you're a nobody posting on an obscure corner of the internet. Think of the bigger picture as to what would be good for Ontario. All evidence suggests this is something Kathleen Wynne - and her predecessor - has literally never done. Which is why her party will hopefully lose official party status next month. If it was the choice of Ford being in power or the NDP, I'm sure most Liberals would choose the NDP to be in power. You'd be correct, if you were talking about liberal voters or even liberal supporters. Hell, probably even card-carrying Liberal grassroots. But the people who actually run the Liberal party and make decisions? Hell no. If they have to give up power for a while, they want to give it to the Tories. Much better for the Liberal party to campaign against Doug Ford next election, rather than Andrea Horwath. Like it or not, Ontario Liberal Party donors and Ontario taxpayers have paid for the Liberal campaign. Withdrawing all of the Liberal candidates would be a fraud on both of these categories of people. How many times has Trump done something and people saying "This is simply not done", he does it anyways and then lives to fight another day. Saying "It's simply not done" is the reason Ford is leading in the polls and Trump is where he is at. There is a mood to blow up the system and people are tired of the status quo. In today's political climate the rules are, there are no rules. And Trump has shown us that. "Almost 15 years after the Liberals took office, Wynne know she’s in the political fight of her life — even at home in the riding of Don Valley West — and that her party faces a massive defeat next month." So instead of being reduced to maybe 1 or 2 seats, and facing a humilating wipe out, I think most Liberals would understand the concept of bowing out gracefully and putting what is best for the Province. But not having a vote split. If it was the choice of Ford being in power or the NDP, I'm sure most Liberals would choose the NDP to be in power. So the only thing to do is withdraw all the candidates. If you will read my post carefully, you will see that nowhere within it did I say that such an act would be 'simply not done'. I said it would be a fraud. There is a difference. Political donations are used to run a political party, not necessarily do all the funds go to an election campaign. It is not like they misappripriated funds. They just changed their minds. Considering the massive defeat they are going to endure, I doubt any of their supporters would file charges of fraud. Devastating news for the Liberals. For comparison in 2011 federally it was 35 percent Liberal, 31 percent Conservative, and 30 percent NDP So Tories and NDP both doing a bit better, Liberals even worse than 2011 disaster. My guess is unless things change Liberals will come in second in almost in every 416 riding with PC's taking suburbs and NDP old city, York, and East York. PC and NDP vote more concentrated, OLP more evenly distributed. I'm aware of the policy. I disagree with your implication that I've violated it. You may notice that I am also a nobody and I am also posting on an obscure corner of the internet; it's almost as if there's nothing wrong with that. But since I now know you must have also seen my other replies, I'm still waiting for you to back up your claim that "nobody else agrees with Sean" when the few who have bothered to speak up at all have all agreed with him either explicitly or at least implicitly (through their disagreement with you), myself included. Perhaps it is you that needs to reevaluate your position in this matter, and not Sean. You say that (you also being a nobody) AFTER I posted the policy. Calling someone a "nobody" is worse than Erin Weir sitting too close to someone, and look what happened to him by the NDP brass. In terms of people agreeing or disagreeing with Sean, when you say a "few" it is only two. When we get to double digits of people agreeing with the three of you saying the Liberals should stay in the race, maybe I'll re-evaulate my position. But the three of you saying the Liberals should stay in the race, and risk vote splitting with the potential of a Ford super-majority, shows you three are in the minority. Or this is what I've been saying. These polling firms want a Ford win, and to do that they have to show the NDP in second. Guaranteeing a vote split on the left. Thus giving Ford a super-majority. Nanos polling is never questioned as he is the best in the business. But I've been saying this from the start. The polling firms that have showed the NDP in second, all use questionable methology and have had their polling questioned as being bias towards the Conservatives. Consistently showing the Conservatives first, even on the Federal level. Myself I only trust Nanos and Abacus, the rest I don't trust. Even if they were to show the Liberals in first. Can you guys give it a break for a while? You posters are littering this thread with a bunch of garbage that has nothing to do with Ontario polls leading up to an important Canadian election! I'm not interesting in reading a pile of stupid drama that yous are posting!!! This is a very interesting election coming up and I'm coming to thise web site because it's a CAN be a good place to get INFORMED! Thanks to posters like North Report for hanging in their and keeping this thread relevant!!!!! Ok you want news, here is breaking news. Former PBO Kevin Page says he never gave a seal of approval on the NDP platform. First, without counting, I'm not even certain there are double digits of people who have posted in this thread. Second, people not speaking up does not mean they agree with your position. You can't assume "three out of three people who have spoken up disagree with me, therefore the other ten people agree with me." And finally, none of are saying the Liberals "should" stay in the race...we're saying it's stupid to ask any political party to withdraw ALL their candidates to help one rival against a third rival. And by the way, we're not stupid. Even if we accepted that the Ontario Liberals might do such a thing, we can see that doing such would set a fatal precedent of argumentation for the NDP going forward including at the federal level. As we all know you know as well. On top of all that, if anyone agreed with you now, we know that (if you're not banned by then) you'll come back in late 2019 and say "but in 2018 you agreed that the party behind in the polls should fold to stop the conservatives...so the NDP should fold so the Liberals can beat the Conservatives." We know you'll do this because you already make a habit of digging up old posts (from before you were even on this board...on this account at least) to try to win arguments. It's a ridiculous suggestion, with the goal of setting up a transparent trap, and it's all the more annoying because of your asinine insistence that because more people aren't telling you how stupid the suggestion is, clearly they must agree with you. "Only five people have told me selling my house and buying lottery tickets is a bad idea. Nobody has supported the idea. The other 495 people I have on facebook haven't said anything. Clearly, my plan is supported by the vast majority of people and the people who think it's a bad idea are in the minority." @WWWTT: Sorry about this. I won't post on this topic again...but now the other members of the board can just link to this reply when MM tries to play his stupid games. People have every damn right to advocate for their positions and even change their positions regardless of the "feelings" of Mighty Liberal or any other Liberal propaganda artist. Only Propaganda artists and trolls come with a mind to hold positions from previous years over people's heads to beat them with it. These are by definition the most close-minded people there can be. So to say that just because you advocated something one year, doesn't mean you have to stick with it the next year. As Sean in Ottawa says, if you hold people to that standard you are being "close-minded" as people can evolve on their positions. So it is perfectly fine to change positions. Actually I have read the rules very carefully and I have done nothing to warrant even a warning, much less a ban. While you Cody87 have broken the rules by calling me a "nobody". I think Ontario in 2018 may finally be catching up to the UK in 1922...moving, finally, to Tory V. Labour as the natural choice in elections. If the NDP makes the showing it seems to be heading for, and sustains its popularity in Ontario going into the 2019 elections, the structural integrity of the federal Liberals could be at risk. The 1922 UK election actually had two Liberal parties, the Liberals and National Liberals. In the U.K. the Liberals joined the Conservatives during World War 1 under Liberal leader Lloyd George and the ramifications of that split the Liberal party for the 1922 election which opened things up for Labour to then become the party of the left in the U.K. In present day Ontario the Liberals would probably be finished as a contender to government if they formed a coalition with the PC Party. It will be interesting to see what happens if the Ontario election does not produce a false FPTP "majority." Mighty Middle is "that guy" who, if their friend says they don't really care for kale, reminds them that four years ago they "claimed" they wanted to eat healthier, then spends the next hour demanding either an admission that they lied then, they're lying now, or a full repudiation followed by a glowing endorsement of kale. If I wanted to read about these other subjects that you’re forwarding I would go to an appropriate thread to. Now as far as the all the trolling and back and forth drama, it sounds like several posters here need to take a break. It is called thread drift, happens in every thread. how about everybody just ignore the trolls on the thread. Don't respond. As Eleanor Roosevelt said "No one can make you react, respond or feel the way you do, without your permission"
You could tell us why this matters. NDP surging in latest On Pulse Ontario poll: PC 35, NDP 34, Liberal 24. However when it breaks down among region, the PC still have the upper hand. I don't see why people are getting upset. The NDP is within 1 POINT of the PC's. They are in a position to win this election. 'Ford Nation' is a small group of simpletons that cannot prop up Ford on their own. Ford peaked way too early,it's all down hill from there. I think the NDP is the natural alternative to the Liberals. What about the Regional breakdown that shows Ford ahead in 3 our 5 regions? That hardly matters if the NDP has strong numbers in the GTA. 35% to 34% The Ford Train is running out of gas. The NDP has the momentum right now. If it continues that way,the NDP will not only win the election but (thanks to FPTP) make up a majority. That breakdown shows the Tory lead declining in those regions. It's all momentum. 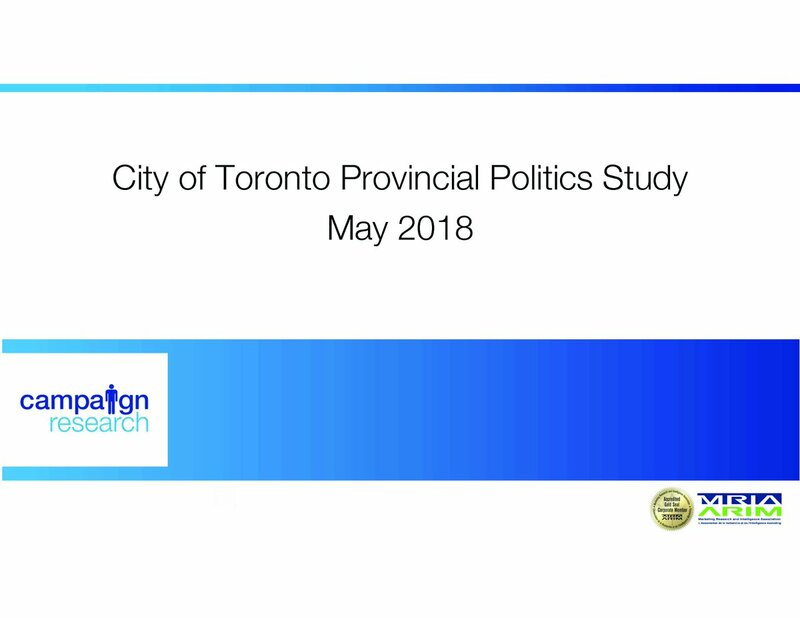 And crucially, it's going to make it much easier to get OLP voters to swing to the ONDP in Toronto, since most Toronto-area OLP voters have ONLY voted OLP in the belief that that party is the ONLY party that can beat the PC's there. 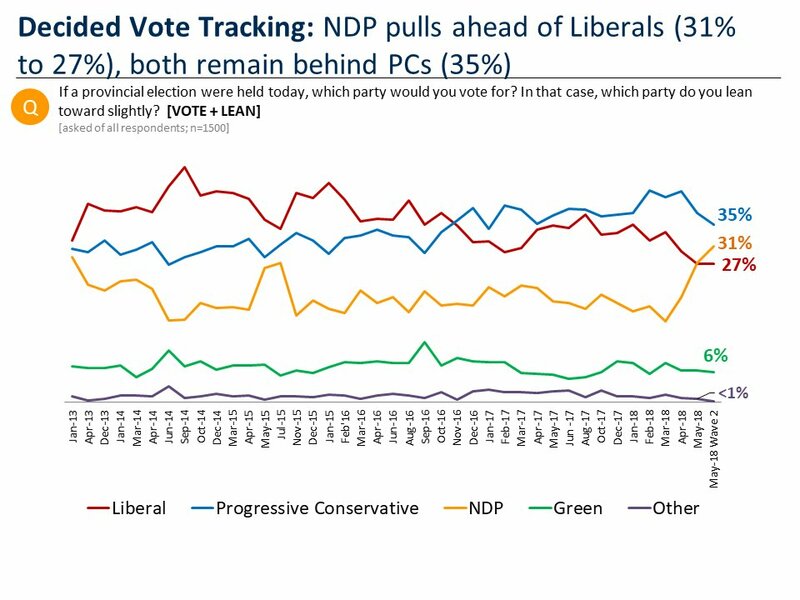 Both parties have an equal shot and the trends are going to be in the ONDP's direction. Clearly, we have proof now that it no longer makes more sense to vote OLP than ONDP in much of region. And the GTHA vote break is now essentially a dead heat...look for a significant swing from the OLP to the ONDP there in the next round of polls. Doug Ford is no longer inevitable, and "2014 ONDP voters" have clearly broken with whatever flirtation they were having with him now. Horwath can bring the rest of them home by acknowledging the validity of the pain they are feeling under the status quo, and by pledging that they won't be left out in the cold in the way the OLP has done for over a decade and a half. That's a weak message. Ford can say the same thing even if his populism is as fake as a 3 dollar bill. The NDP needs to lay out their plan,their platform,their policies while they have this momentum. Hopefully,they don't waste this oppurtunity to prove that they are the best alternative for Ontario. They need to go for the jugular in regards to Ford. They shouldn't waste their time attacking the Liberals. It looks like they are toast already,anyway. Not sure why Eastern Ontario remains loyal to the Liberals. Is it the whole "Franco-Ontarian" thing? Is there some belief on the part of that community that no party OTHER than the OLP would ever "defend their interests"? If so, that's a little weird, given that to my recollection, the Rae government didn't do Franco-Ontarians any harm or put any of their rights at risk. They need to go after Ford, that's true. Part of that, though, is a need to connect with the feeling of alienation that Ford has misappropriated. It's about saying to his "nation" something like "Yes, you've been screwed over. But unlike Ford, we're actually going to help you...we're actually going to make life better for you. We acknowledge your anger and we're going to change what you're really angry ABOUT". It's a combination of validation and hope. The Liberals will always have loyalists and they will always have strangleholds on some ridings. You don't get 15 years of power for nothing. At this point I think it's safe to say the Liberals won't get another 4 years this election. I think the NDP is in the driver's seat. If the NDP blows it and if it becomes apparent that Ford is an incompetent buffoon,you never know. The Liberals could pull off an upset. Stranger things have happened. That's precisely the message I'm talking about. But they should also be transparent and unveil a real plan. People are growing tired of empty platitudes.